Mara Hall, artistic director for the Leimert Park Harmony Project in Los Angeles, says her experiences while attending Jackson State University is the reason she, her students and their parents worked over the summer to raise $10,000 for a three-day visit to the HBCU last week. 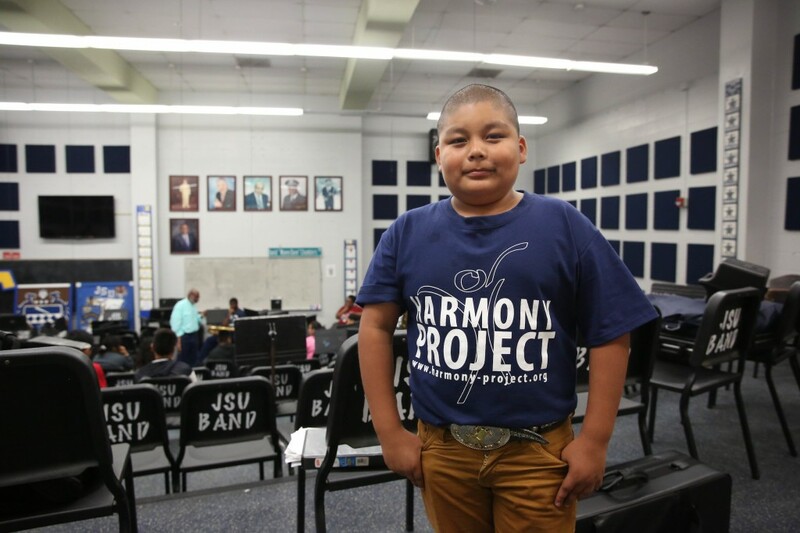 Established nearly 17 years ago in Los Angeles County, the Harmony Project is a nonprofit that provides free musical instruments and lessons to children from low-socioeconomic backgrounds. Every student also plays in an ensemble or orchestra. 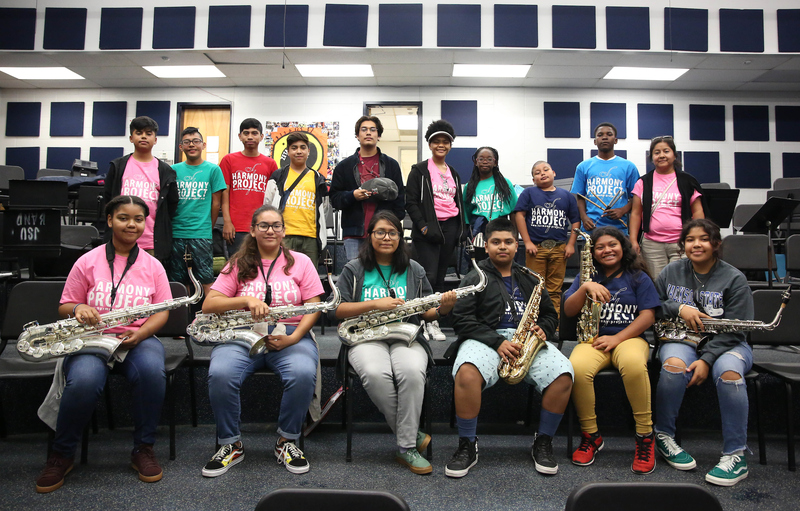 During the 2016-2017 academic year, over 2,400 underserved children were provided tuition-free, sequential music programming, according to the organization’s annual report. “We also brought them here because we try to expose them to different colleges and musical campuses all around the country,” says Hall, adding that she wants to introduce students to music outside California while helping them understand that their possibilities in life are endless. Lowell Hollinger, associate director of bands, helped to coordinate the student’s music lessons and schedules at JSU. He points out the lack of HBCUs on the West Coast, calling the trip advantageous not only for the students but for the university, too. When Hall first witnessed the “world famous Sonic Boom of the South” performing live, as a teen, she says the feeling was indescribable. Later, she watched the band exhibiting their talents on television during the 25th Anniversary of Motown Records celebration. “When they marched down Hollywood Boulevard to the Pantages Theatre, I said I’m going to that school, and I did,” she says. True to her word, Hall attended the HBCU and played the tuba and clarinet for the Boom before graduating with her bachelor’s in music education in 1998. 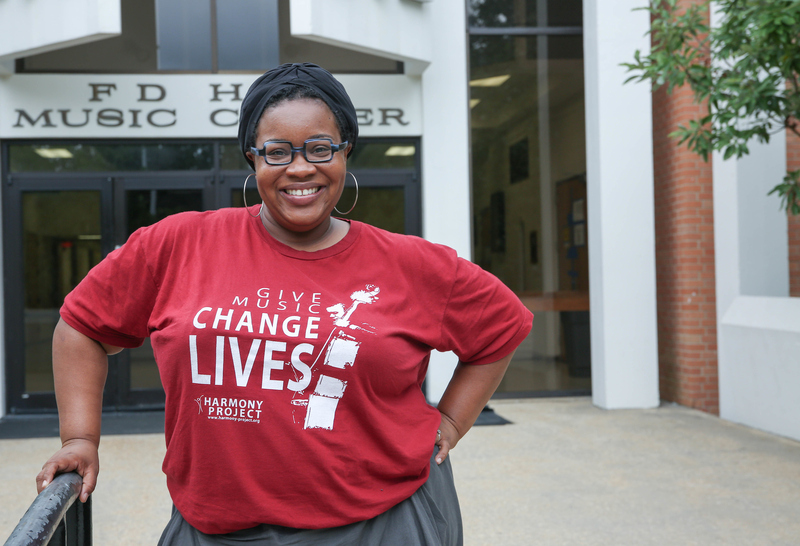 The alum shares that she wanted the students to see the school that “made me who I am today.” So in June, after deciding to attend Jackson State’s High School Day, Hall worked with parents and students to create a vigorous summer fundraising schedule to cover expenses. Jazz nights was one of several fundraisers hosted by the group. 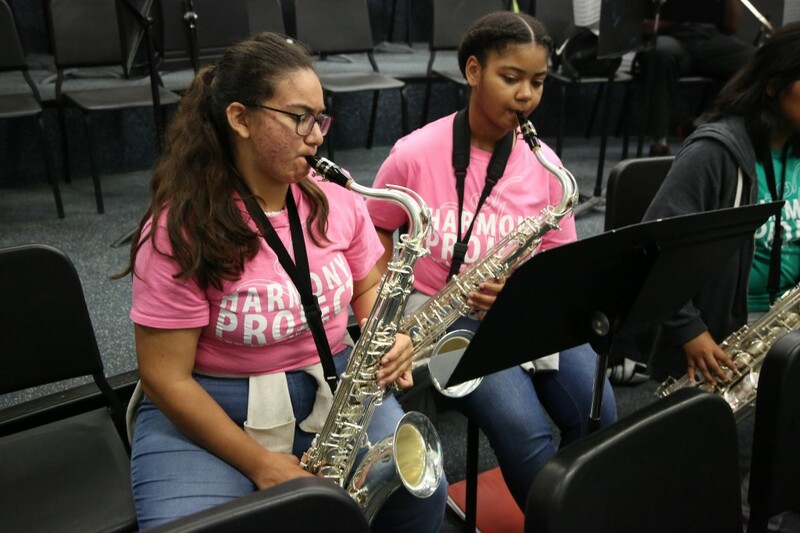 While the intermediate and advanced orchestra students played a series of jazz and funk pieces at a local venue, parents sold authentic Mexican and Belize food, and patrons paid an entry fee to attend. “They went all out. I was so impressed. It was amazing. They believed in my philosophy, and they believed in me,” says the bubbly Hall, whose conversation is peppered with humor and laughter. When the organization fell shy of their $10,000 goal, Hall’s friend and fellow alum, Dr. Carl Cunningham, shared the Go Fund Me link on his social media platforms helping them hit their mark. Once the students arrived on the JSU campus, they attended several master classes led by music professors like Dr. Russell Thomas Jr., among others. The cohort also toured the school, attended the Sonic Boom’s rehearsal, and watched the Tigers play Alabama A&M at Veterans Memorial Stadium. Karlene Linicone, 17, describes her time at the HBCU as fun and exciting. “We met really gifted artistic people. It’s crazy how everyone is so talented here. I’m thinking about coming to JSU. I’m looking into it,” she says. Pedro Rojas admits to never being outside the city limits of his hometown until now. “I learned about the differences between L.A. and Mississippi, and I learned how to play my trumpet in a new way,” says the 13-year-old. 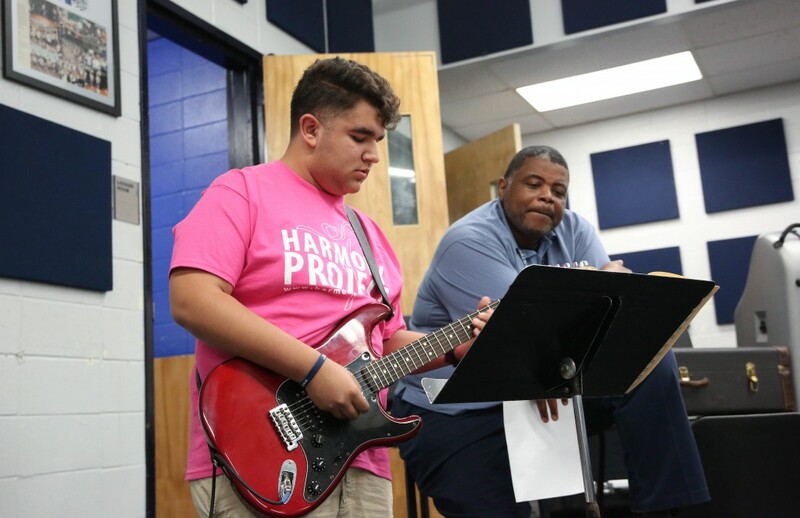 According to junior Fernando Gallardo, the Harmony Project helps students see the world differently, and he is one of them. “I’ve enjoyed being able to learn from people who have experience and who have done so many cool things, and they can pass it down to students like us,” he says from the hallway of F.D. Music Hall. Afra Garcia is the only female trumpet player in her ensemble. However, she doesn’t mind because the boys “act like my big brothers and cousins.” Garcia explains that after hearing so much about the HBCU from her director, she was thrilled to learn they would be traveling to the capital city. 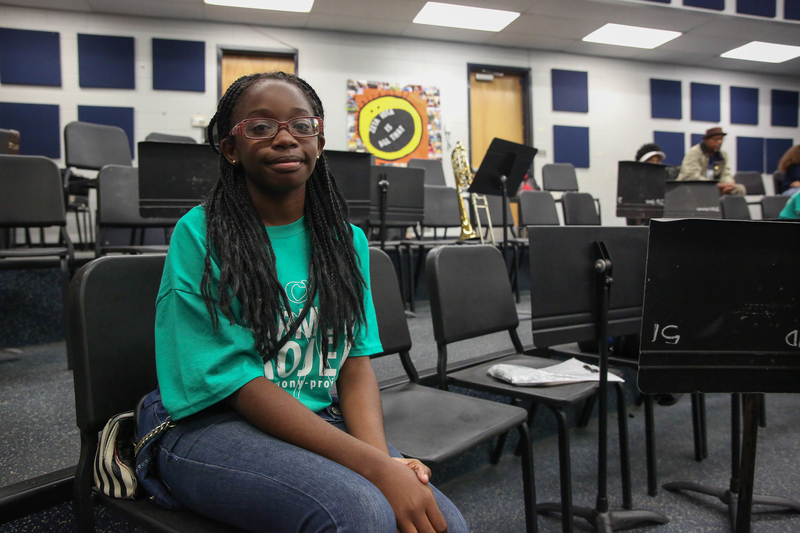 “I got really excited…I’m thinking about attending for sure,” says the 7th grader. Four years ago, Hall began working with the Harmony Project, but it was acting not education that compelled her to move to California. Having served as the assistant director of bands at Morehouse College and a middle and high school music teacher, Hall says she lost her passion for instruction when she was laid off from the Detroit Public School System. “I really took a vested interest in acting, but I didn’t think that could be a real career. I thought, ‘You can’t be an actor.’ But I did my research. I went to New York and L.A, but I liked L.A. better,” says the alum, who also holds a master’s in clarinet performance from the University of Cincinnati College of Conservatory Music. Hall went on to earn roles on “Grey’s Anatomy,” “Scandal,” “The Quad,” “The Resident” and other major networks. 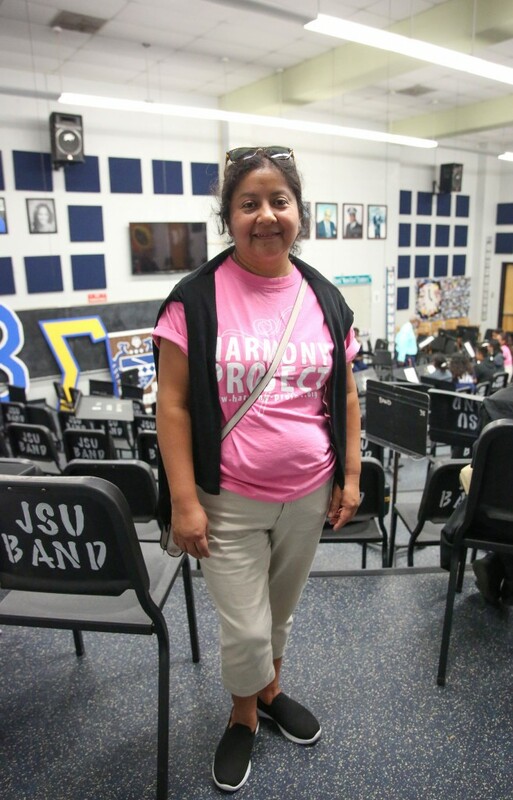 Between acting auditions, she began volunteering her musical gifts at different high schools and band programs. The musician quickly gained a reputation for increasing student attendance and engagement. “I started teaching at Ramón Cortines School of Visual and Performing Arts and that just opened up the floodgates,” she explains. Someone soon offered her a job with the Harmony Project. Initially, Hall says that she didn’t want to take it because of the disappointment she felt after losing her teaching job in Detroit. Despite her misgivings, Hall accepted the position and has not missed a beat. She continues to put music in the hearts of every child she encounters. Recently, she was honored by the nonprofit for her excellence in teaching and service. When it comes to her alma mater and the Harmony Project, the alum says her overall mission is to develop a series of internships and partnerships. “JSU students could come to Los Angeles and do internships during the summer and throughout the year,” she says, adding that she also hopes to get a large contingent from the organization to enroll in JSU’s music programs specifically the orchestra. If you would like to donate to the Leimert Park Harmony Project click here.